Are you noticing large wet patches on your lawn, or patches of grass that are greener than the rest? These signs might be indicative of an underground water leak caused by a burst water pipe. These leaks are more common on older properties or when large concentrations of tree roots are present. 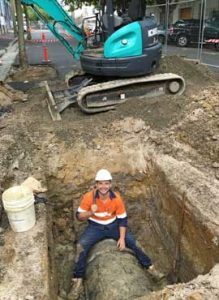 Fortunately, Lateral Plumbing Solutions can provide professional underground leak detection in Melbourne. We’re able to find underground water leak problems and provide prompt repairs to restore functionality. If you want to know how to find a water leak outside underground, there are several reliable ways to do so. The most obvious involves turning off every faucet and water-related appliance, checking the gauge on your water meter, and then seeing if the needle moves. There might also be obvious signs that an underground leak has occurred, such as sinkholes or mushy ground, but an expert may be needed for precise plumbing water leak detection. At Lateral Plumbing Solutions, finding water leaks in underground pipes is our specialty. We have access to the best detection equipment and use the most effective methodologies to achieve optimal results, including directional drilling. If a water pipe has burst underground somewhere on your property, you can rely on us to provide accurate underground leak detection. Lateral Plumbing Solutions is proud to be a leading underground water leak detection company. If you have any questions or want to make a booking with an experienced leak detection plumber in Melbourne, contact us today.